Today in Masonic History George Graham Vest is born in 1830. 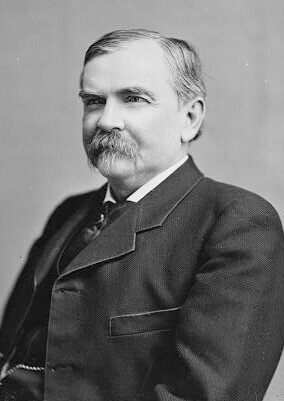 George Graham Vest was an American politician and attorney. Vest was born in Frankfort, Kentucky on December 6th, 1830. He graduated from Centre College in Danville, Kentucky in 1848. In 1853 he graduated from the law department of Transylvania University in Lexington, Kentucky. That same year he was admitted to the bar and planned to move to California. On his way to California he stopped in Pettis County, Missouri where he defended an African-American defendant accused of murder. Vest won the man an acquittal. Shortly after the man was burned at the stake by an angry mob. Vest was threatened as well, although no action was taken against Vest. After the incident with his first client, Vest decided to remain in Missouri. He moved to Boonville, Missouri in 1860. There he ran successfully for the Missouri House of Representatives as a Democrat. He served in the House until 1861 and while there wrote the Vest Resolutions where he denounced the coercion of the South. Vest was a "states rights" advocate and sided with the Confederacy. He also proposed the Secession Ordinance, the generic term for the documents passed by Missouri and the other 12 states that seceded from the United States during the American Civil War. The Ordinance was passed in October of 1861. Once the war began he served as judge advocate for the Army of Missouri. He also served in the Confederate House of Representatives from 1861 to 1865 and at the end of the war in the Confederate Senate. After the war, Vest returned to his legal practice. It was in 1870 that Vest had his most famous case, the case of Burden v. Honrsby. In the case Vest represented Charles Burden and Old Drum, sometimes just Drum, a foxhound. The case involved Hornsby, a sheep rancher, making the public statement that he would shoot any dog found on his property, no questions asked. When Old Drum wandered on to Hornsby's property he followed through with his threat and killed Drum. Burden wanted $50 in restitution for the death of his dog, the maximum allowed in Missouri at the time. Vest stated that if he would "win the case or apologize to every dog in Missouri." It was Vest's closing argument that gained him notoriety Vest used what is commonly called purple prose, the use of such flowery language that it distracts from the point of the story. Gentlemen of the jury: The best friend a man has in this world may turn against him and become his enemy. His son or daughter that he has reared with loving care may prove ungrateful. Those who are nearest and dearest to us, those whom we trust with our happiness and our good name, may become traitors to their faith. The money that a man has, he may lose. It flies away from him, perhaps when he needs it the most. A man's reputation may be sacrificed in a moment of ill-considered action. The people who are prone to fall on their knees to do us honor when success is with us may be the first to throw the stone of malice when failure settles its cloud upon our heads. The one absolutely unselfish friend that a man can have in this selfish world, the one that never deserts him and the one that never proves ungrateful or treacherous is his dog. Vest won the case and was successful on the appeal in front of the Missouri Supreme Court. A statue of Old Drum can be found in front of the Warrensburg, Missouri Courthouse and a bust of the dog can be found near the Missouri Supreme Court in Jefferson City, Missouri. In 1877, Vest moved to Kansas City, Missouri. In 1879 he was elected to the United States Senate. He was reelected three more times, serving until 1903. During his time in the Senate he became a staunch defender of Yellowstone National Park. It came to Vest's attention that there was corruption in some of the contracts that had been approved by the Department of the Interior. Vest successfully championed a bill that required all contracts under the Department of the Interior to be approved by the Senate. While Vest was in the Senate in 1891 he attended and gave a speech at the Missouri ex-confederate convention. This speech has led some to give Vest the credit for the phrase "history is written by the victors." In his speech he said "In all revolutions the vanquished are the ones who are guilty of treason, even by the historians, for history is written by the victors and framed according to the prejudices and bias existing on their side." The true origin of the phrase "history is written by the victors" is unknown. Vest passed away on August 9th, 1904. It is unclear what Vest's home lodge was, some records indicate it was in Kansas. He was exalted in Sedalia Chapter, No. 18, Royal Arch Masons in Sedalia, Missouri on February 28th, 1868. He demitted from the chapter in 1879 when he left for Washington, D.C.